If you find yourself swelling or rounding out a bit, you might need to detox, as it is usually an indication that your lymphatic system is not functioning properly. The toxins that are supposed to be eliminated via the lymph get stuck in the glands and the balance of fluids in between the tissues will be out of whack too, causing orange peel skin, cellulite and also, for instance, the notorious “love handles” over the hips. As with everything there are other factors contributing as well, but for simplicity’s sake, lets keep to the Toxin Overload. Eventually you want to be doing dry brushing with a stiff bristle brush or a rubber brush, but to start off with you can do it in the water or on wet skin to eliminate friction. 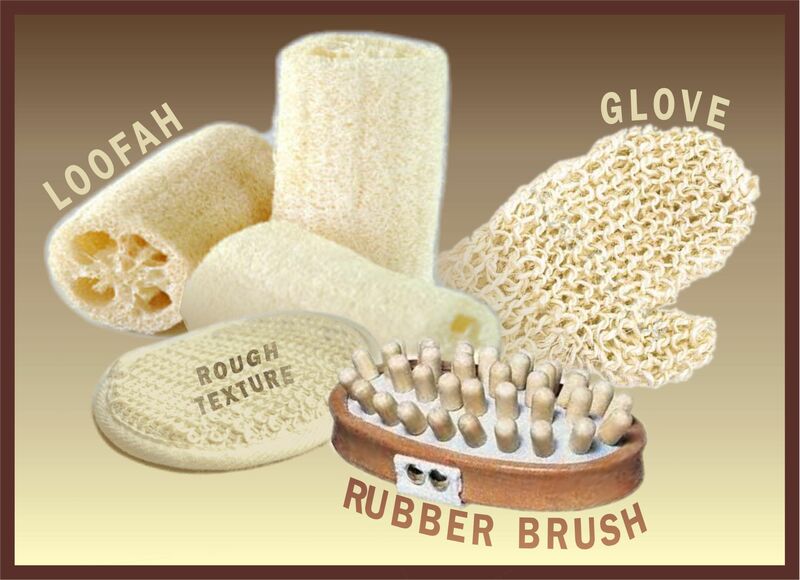 Body brushing stimulates the lymphatic system and loosens up the toxin buildup in the lymph glands. All the small lymph glands drain into big glands under your arms and in your groin, so you need to work around these areas a lot, preferably working towards them to assist the draining process. To assist the elimination of the toxins that would have now been released into the bloodstream, you can dissolve 2 tablespoons of rock salt, coarse pure sea salt, or 2 handfuls of Epsom Salts in your warm bath water and lie in it for about 10-20 minutes to allow the toxins to be drawn out through the pores of the skin. Pat dry and stay warm afterwards for a while. If you’re not bathing, but showering, allow the warm water to flow over you for about 5 minutes, totally relaxing your mind and breathing out deeply. You can also have a half an hour detox foot bath afterwards to draw the toxins out. Remember to drink extra water to replace lost liquids due to sweating. You can soap and wash as normal after body brushing if you’re not having a detox bath. Just drink lots of water then to help to flush out the toxins. Do Body Brushing at least 2 to 3 times per week for the best results. You’ll see results quicker if you do it every day. Persist for at least 2 to 4 weeks. Even better if you can make it and detox baths a part of your weekly routine. It is not only good for lymph drainage, but also helps to get rid of dead skin cells (exfoliation), and stimulates blood circulation. To prevent lymph and sweat glands under your arms to block up, it is better to avoid the use of antiperspirants, especially those that contain aluminum. It is one of the biggest causes of breast cancer due to its action of blocking the pores and overloading the glands. Aluminum in the system is also one of the causes of Altzheimer’s. Rather use natural body products that contain essential oils (for instance) to combat and prevent bad odor. Keep in mind that whatever you put on your skin absorbs into your body through the skin’s pores. Remember, our bodies are built to move, and it is muscle movement that pumps the lymphatic system, so exercise and stretching is still the best way to keep your system going!